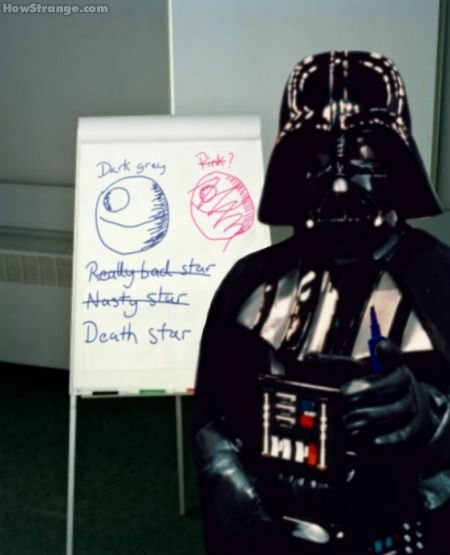 Was “Death Star” an officially designated name? In A New Hope, the Death Star is only referred to as such (in dialogue) on four separate occasions; three of which are the intercom at the rebel base on Massassi, so I'm not sure they count as truly separate. It does appear in writing in the opening crawl and, likewise, in The Empire Strikes Back (where it is obviously not verbally mentioned at all). In Return of the Jedi, it appears again in the crawl and in dialogue -- to my count -- five times (more, but not by much given the plot). I haven't had a look through the scripts of the prequels; however, I would assume it's hardly mentioned, as it's still in the planning phase. Anyway, it seems the only time it is referred to as the "Death Star" by an agent of the Empire is that one non-intercom-time in A New Hope and again by Darth Vader in Return of the Jedi. Was the "Death Star" therefore an informal name used by the Rebellion -- albeit sparingly -- that caught on with the Empire as time went on and, if so, did it have an official designation? The Emperor: [In the throne room, Luke is watching the Imperial fleet attack the Rebels from the huge throne room window] As you can see, my young apprentice, your friends have failed. Now witness the firepower of this fully ARMED and OPERATIONAL battle station! General Tagge: What of the Rebellion? If the Rebels have obtained a complete technical reading of this station1, it is possible, however unlikely, they might find a weakness and exploit it. Darth Vader regained control of his damaged TIE fighter. As he headed for the nearest Imperial outpost, he was not preoccupied about how he would explain the loss of the Death Star to the Emperor. While it's by no means certain that the official name for the station is "The Death Star", it's certainly called that by both the Rebels and the Empire. Galen Erso, the lead engineer on the Death Star project, says in a hologram to his daughter Jyn that "We call it the Death Star... there's no better name for it." This seems to indicate that the name originated with the engineering team. Incredible to think about. And if he kept racking up missions like the one just completed, there was a very good chance that he would be assigned as unit commander on board the new station. He led his squad back to the equatorial launching bay. Looking at the awe-inspiring base, he felt a surge of pride in the Empire, and a feeling of gratitude at being a part of the Tarkin Doctrine's glorious mission. There was no official appellation or designation, other than battle station, but there was a name for it that everybody he knew, officers and enlisted alike, used. They called it the Death Star. So at the very least, in Legends, it seems like it was an unofficial nickname in the absence of anything official other than "battle station". Note that it still doesn't say where the nickname came from; it could have just as likely been from among the Imperial troops as from Palpatine's original plans for the station, but we do know that it didn't come from the Rebellion since the book starts before the Rebels knew about it. 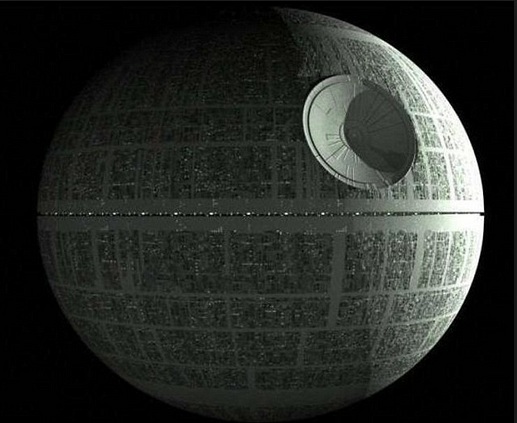 The Death Star, also known as the Death Star I, First Death Star, DS-1 platform and previously known as the Ultimate Weapon and Sentinel Base, was a moon-sized deep space mobile battle station constructed by the Galactic Empire after the defeat of the Separatists in the Clone Wars. It boasted a primary weapon with sufficient firepower to destroy an entire planet with a single shot. "Have you ever heard of an Imperial base code named'Death Star'". Which means that it was the official designation of course if that doesn't convince you (and since it was Leia who said this then the point could be made that she wouldn't know the official designation) well earlier in the dramatization Leia has been told of e Death Star by her father.
" Death Star!? Where did you here that, that is a classified ongoing Impearial progect." So to answer your question yes Death Star is an Official Designation. Is there any explanation provided by the franchise behind the name Death Star? What is the largest number of Star Destroyers shown on screen at the same time? Were medals awarded after the destruction of the second Death Star? How does education work in the Star Wars galaxy?